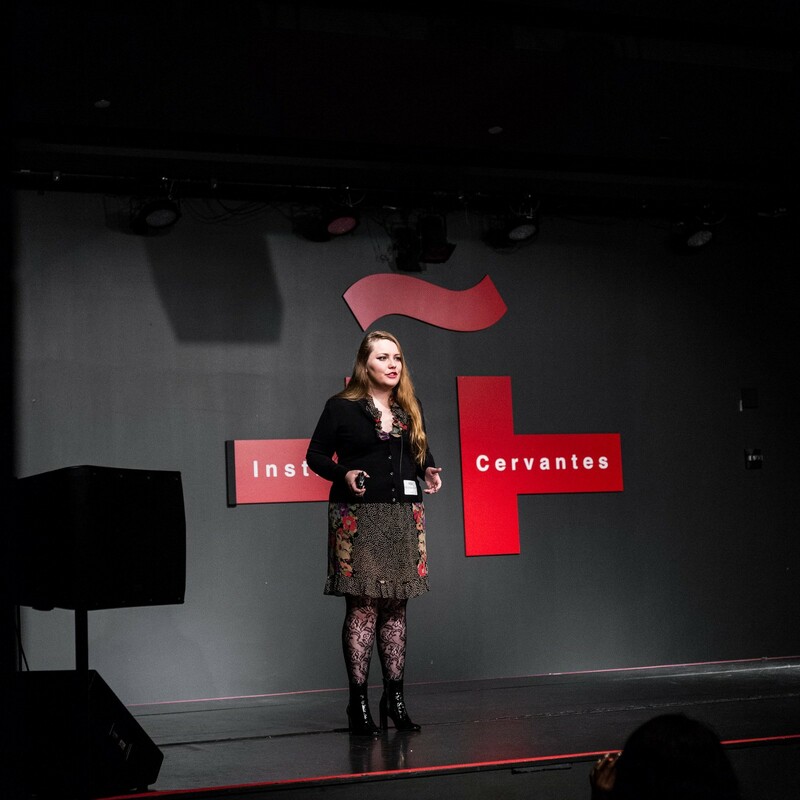 This is a transcript from my Prospanica ExecTalk delivered at Instituto Cervantes on October 5th, 2018. I work in a space called diversity, equity, and inclusion. And what that means is that typically, I’m talking to middle-aged men who are white, and they’re asking me what their problem is. And that’s basically every day of my working life. And they want me to tell them how to create the conditions for everyone to thrive. And they look at me and they have this really distressed expression on their face because they have talked to other people before. And those people have told them it’s going to take 18 to 24 months just to chip away at that iceberg. That they are going to have to reorganize, that they are going to have to invest differently, that they are going to have to solve these tremendous challenges and it is going to be slow and hard and they want me to tell them that that’s a lie and that I have the secret. And so they ask me, and they ask, “What is the magic bullet? What is the answer?” And I tell them, “the situation is more nuanced than you think it is, because you’re dealing with people. But there is a quick answer to how we get all of this started.” And that’s to listen. And they look at me perplexed, because listening is a kindergarten skill. Everybody listens. If listening was the solution, we wouldn’t have a problem. But here’s the thing: I know that we don’t listen. I know that we don’t listen. If you think about the best listener you know, and you reflect on how they listen to you and how you feel when they listen to you, you know that they’re different. You know that that’s not every interaction that you have. And also, I know what it’s like to not be listened to. I spent most of my career in venture capital, which is a very small industry. There are 800 firms in the world. More people work at Accenture than in this industry. And in my firm, I was the only woman hired, the youngest person by 10 years, not just in my firm but in my role in the industry, and I was one of 27 Latina women nationally working in the industry. So I know what it’s like to not be listened to. And I can tell you that I had that experience consistently. The first technology company that I ever joined was made up of all engineers. And I was the only non-engineer. I was there to help with marketing and communications, and while I was putting together the content for the website, I decided that I wanted to learn how to build the website, too. And so I started teaching myself to code in the evenings. And I got really excited about pursuing this path — about being a developer. This was something very different, something very new. And I decided I was going to talk to my CEO about it because he was a software engineer, and he was the closest thing I had to a mentor. So we had a one-on-one meeting, and I was going to tell him my plan and I was going to ask for his advice. But here’s the thing: how many people here have been in a conversation where the other person is looking at their phone? How many people here have been that person? And because I was 19 years old, and because that was my first internship at a tech company, and because that was the closest thing I had to a mentor, I listened to him. And I learned that I couldn’t be a developer, and I also learned that I wasn’t worthy of being listened to. And I’m not alone. So let me tell you something about listening. Do you know that the University of California Santa Barbara did a study on casual conversations, coffee chats, and what they found is that an hour-long conversation would take place, and men would interrupt men 7 times each. Men would interrupt women 46 times. Women interrupted men twice. Now if you’re thinking to yourself, “those numbers are crazy — I want a more conservative study.” I’ve got one for you, too. So this is George Washington University. George Washington University wanted to look at the work place, where there tends to be better etiquette around communications because of the social pressure. And what they found there is that men interrupted women 33% more than they interrupted other men. If you look at the data, it’s the same for people of color, it’s the same for people over the age of 40 in predominantly young environments, it’s the same for veterans, it’s the same with people with disabilities. We don’t listen to people who are not like us. I say this all the time to my clients. I actually think the Buddhists have it right, because they say there are 5 core fears, and they’re the ones you would expect: fear of pain, fear of death, but fear of unknown states of mind is one of those fears. We don’t listen to people who are not like us because they are unfamiliar. Because it is cognitively difficult to take in information you cannot control. That you cannot expect. You have to think about echo chambers and social media and how we listen to the people who think like us and talk like us. Because it’s easier for us. But let me tell you what happens when people don’t listen. If you are interrupted 46 times in a conversation, are you going to keep talking? And when we don’t communicate, we don’t connect. We don’t build a support system. We don’t build social bonds. We don’t build a network. And what do they say in business? You can’t get anywhere without a network. It’s about who you know. But if you’re not talking, you’re not getting to know anyone. And that means you’re missing out on opportunities. When we look at the pipeline problem in technology — the fact that we don’t have enough women and we don’t have enough people of color — we don’t at the entry levels — what’s happening? People aren’t connecting because they’re not communicating and they’re missing out on opportunities. When we don’t listen, people leave. And our companies don’t grow. Because why does diversity matter, from the business case? It’s why my Alexa doesn’t understand me when I talk. Because when Amazon built it, they didn’t test it on females. They didn’t actually have female engineers build it. And so when I tell her, “Please set this alarm,” she plays Kid Rock every time. And that’s what I have to suffer. Right? So we miss out on business opportunities because who buys more Alexas than any other demographic group? Women. We miss out on opportunity. Innovation comes from taking an idea from here, an idea from here, and putting them together to make an integrative decision. If we don’t listen to the people bringing the ideas from over here, we don’t change. We don’t get to those next practices. Period. So this is what I want to leave you with today: every single person in this room can be a better listener. You can all be active listeners. It’s a technique from 1957 developed by Carl Rogers and Richard Farson out of the University of Chicago. They were trying to make communication more effective in business. It’s three steps: the first is listening for content and context. You know what our mistake is when we listen? We listen to hear — we don’t listen to understand. We have to look at body language, we have to look at energy level, we have to look at tone, as well as what’s said. Two, we have to paraphrase. That means we’re listening so intently that we can actually say back what was just said to us but with our own interpretation. It’s not repeating word for word, it’s actually putting the context into our paraphrase. And the last piece is noting all the cues. That’s different from content and context, because that’s happening second by second. You have to be able to take a picture of everything that happened in that conversation and be able to reflect and say this is the overall sum. There are 5 things — five — that everybody here can do to be better active listeners. You can nod, lean forward, blink with compassion, turn your chair in — that’s step one. When we have open body language, we signal that we are receiving information. Two, allow for long pauses. They make us uncomfortable, but do you know why we end up interrupting so much? Because we think somebody else is finished. Allow for space in conversation. Three, when you paraphrase, add a clarifying question. The danger with paraphrasing is that you are interpreting. So if I say, “You seem frustrated,” and you are not frustrated, I have just passed judgment. But it’s different if I say, “It sounds to me like you’re frustrated. Am I getting that right, or am I missing something?” All of a sudden, I have a curiosity mindset and not a judgment mindset. Four, put away your phone. Put away your phone. If you’re talking to someone, close your computer. Eliminate distractions. Continuous partial attention will kill you. How can you build connections with people if you’re never fully there? Why is it important that everybody here does this? Because we respond to models. Men interrupt women because K through 12 educational studies show us that girls are punished for interrupting, and boys are not. And on top of that, girls watch women not interrupting and being quiet and they watch boys — and boys see this, too — men interrupting with no consequences. And they don’t know that’s what’s happening, but subconsciously they process it and they imitate, because we are natural imitators as humans. So I need you to go out and be active listeners because you will be the models. You will be the models that ultimately create the environment where other people imitate you so that you are listened to, as well. You have to be the change in order to see the change. And so I’m going to leave you with this thought: don’t be my first boss — don’t be glued to your phone, making assumptions about someone’s social identity instead of knowing them. Be my mentor. When I told her I didn’t feel worthy of being listened to, that I didn’t deserve to have my own company, that I didn’t want to ask people to believe in me if I couldn’t earn that belief, do you know what she did? She nodded and leaned forward and looked me in the eyes and she asked me a question. She asked me who I wanted to be. And 6 months later, I became an entrepreneur. Everybody here can do that for someone else.